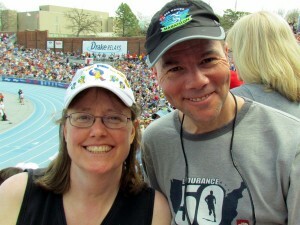 Kathy and Andy Roat, Owners of Fleet Feet Sports in Des Moines’ East Village. Meet our newest neighbors, Fleet Feet Sports. Launched on June 12 by Kathy and Andy Roat, Fleet Feet specializes in running and walking shoes, as well as fun couch-to-5K programs for runners and walkers of all ability levels. Learn more from our recent conversation with Andy Roat. Andy: Fleet Feet Sports stores are actively involved in their communities. We’re Des Moines people. So once we decided we’d be in Des Moines, it become clear the East Village was where we wanted to be. We’re in the midst of several very compatible businesses (like Capital Chiropractic), the merchant community is very welcoming and supportive, and there are great places to run, eat and drink! What did you do before opening Fleet Feet? Prior to Fleet Feet Sports I was in radio broadcast advertising. I helped other businesses grow through sharing marketing ideas and creating traffic building campaigns utilizing radio. Running has long been an important part of my life. When I was young running helped identify who I was. Later on, running helped me deal with my “mid-life crisis”. Running is something that helps me enjoy life more fully. And that’s actually a part of our mission of Fleet Feet Sports Des Moines: To help others enjoy their lives more fully through an active lifestyle. What is your No Boundaries program? Fleet Feet Sports serves runners, walkers and people who want to be. Our four key words are: fun, fitness, encouragement and education. We’ll have shoes, apparel, accessories, and training programs. One of our programs in called “No Boundaries”. “No Boundaries” takes people from whatever level of activity they may be to completing a 5k (3.1 miles) in 10 weeks. To introduce Fleet Feet Sports to Des Moines, our first No Boundaries program is totally free. More details can be found at our web site, www.fleetfeetdesmoines.com, or at our Facebook page. The store is located on the corner of E 6th & Locust (521 E Locust). Hours are weekdays 10 am – 7 pm , and Saturdays 9 am – 5 pm. The store number is 515-323-3338.